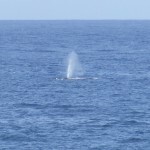 February is the month in which you can see the whales. 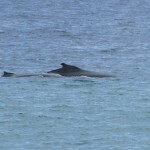 Fogo is on the route of migration of these giants of the sea and with a little ‘luck you can see them spend a few meters from the shore. The show goes on, with varying fortunes, until the month of June. 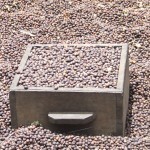 The month of February is synonymous Fogo coffee: start the collection of one of the best coffee in the world, acknowledged. 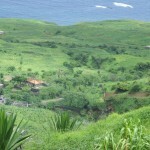 The area north of the island, behind Mosteiros is largely cultivated coffee and since February we find many people (mostly women) involved in the collection of these precious berries, the bags are then taken downstream in head or mule, will be left to dry in the sun and then again manually removed the skin will produce the grain ready for roasting here that you also hand in the oven or in a pan of bakeries in the house. The modest production does not allow the export of the product, but the tourist who tastes it never fails to bring a little ‘with him as a souvenir of the island. 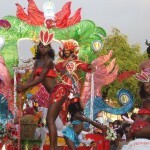 The carnival is a party “pagan” deeply felt in Cape Verde. It is famous carnival in Mindelo Sao Vicente, known as a “small Rio de Janeiro”, but in all the islands lived intensament and Fogo is no exception to the rule. 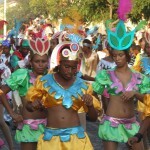 By the end of the carnival you start thinking about the next, such as themes, such as costumes, choreography, music, miss. The whole village participates in the carnival, each for their own group and Sundays preceenti the parade of Mardi Gras already you can see the road to the city while the various groups parade through the latest evidence. The finale takes place with the traditional parade of Mardi Gras with the various groups that offer their floats to win the best judgment of the jury and to win the first prize. The last days of April are dedicated to the most important festival on the island of Fogo, the feast of Sao Filipe (the largest town on the island). The last week of the month will be events of sports, cultural and recreational, that will end the 1st of may, the day with the “Cavalhada Final“, an exhibition horses in the center of the village. These horses also come from the others islands of archipelago. This begins in the afternoon after a great lunch at the “House of Bandera” in which is possible participate only with invitation of the family that organizer (every year at the end of the day is chosen the family of the following year) . 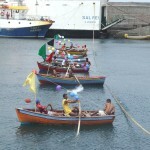 In the days preceding you’ll find competition of rowing, cycling, athletics and soccer, but also the”cockes corrida” (here absolutely bloodless) and the inevitable “pilon” (the grinder of corn made ​​entirely by hand n in large mortars from multiple people) accompanied from the traditional music of “tambureros” and chants of “coladere”. In the evening until late at night on “Presidio Square” alternate Capeverdean artists and not in a potpourri of music and dance typically local. Everywhere is possible find little kiosks where you can refresh themselves with grilled chicken and spits, cold beer and grogue. In June begins the era of the egg-laying turtles. Females mostly like Caretta Caretta out of the sea at night to search for the most appropriate place to dig their nests where they lay between 80 and 120 eggs. After 45-60 days (depending on weather conditions) the eggs hatch and the baby turtles go to the ocean to face a harsh daily life that will bring them back, perhaps, (only a small percentage survives) after at least 25 years on the beach native to continue the cycle of life. Throughout Cape Verde there are several projects for the protection of these wonderful animals that human stupidity is leading to extinction for the alleged aphrodisiac properties of its meat and the male sexual organ. 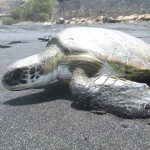 Many Cape Verdeans eat the turtle as a traditional dish, but unfortunately many tourists ask and some unscrupulous restaurateurs offer it under the table. 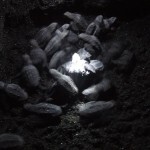 Hundreds of volunteers patrol the beaches at night archipelago, protecting the nests with eggs and labeled the turtles to create a database that will serve to protect the species. 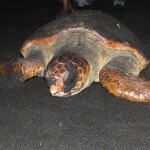 In the sea of Cape Verde you can meet green turtles, loggerhead and leatherback turtle rarely. 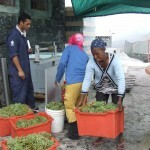 Unlike Europe, in Cape Verde, or rather in Fogo, harvesting begins in early July and lasts until early September. 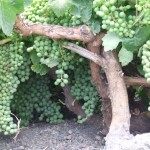 The cultivation of lasted more than a hundred years, which was introduced by the Portuguese with native varieties that have become both white grapes than red, plants, protected by small stone walls of volcanic rock, are covered with bush, to protect the wind that often blows hard inside the volcano. 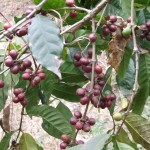 The peculiarity of this crop is located inside the caldera of the volcano more than 1700 meters above sea level and is not irrigated except at night or moisture from the little rain during the summer. 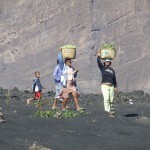 Large bunches sweet collected from the entire population and brought in baskets on their heads (women) or donkey are sold in the market of São Filipe, while a large percentage shall be increased to the cellars (“Cha” inside the volcano in the village of Portela and “Sodade” out of the volcano at Achada Grande) for the production of the famous Fogo wine, appreciated by all tourists who partake in the local restaurants, then every manufacturer maintains a quantity of grapes to make wine at home the traditional local the Manecom, to drink with family or friends. Italian cooperation in recent years has led to centuries of experience that has allowed local producers to improve an already good wine and start new production such as grappa (distilled from grape wine), the raisin wine and liqueurs from herbs. 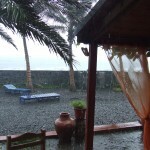 The “rainy season” is a term greater than what actually happens in Cape Verde. A Fogo already see the first drops in June in the north of the island (which is rightly more prosperous and cultivated in the south), while in the south you have to wait the end of August and September. The rainy season coincides with the passage of disturbances coming from Africa into contact with the ocean can turn into tropical depressions, tropical storms, and continued on their way to America, get to be hurricanes that bring a lot of damage in the the Caribbean and the Gulf of Mexico. Rainfall, often in violent bursts typical of tropical areas, are expected by the whole population that counts on the rain for the annual harvest season. The campaign is sown at the first notice of clouds carrying rain, and quickly change the view of the island, the first dry and brown, so lush and green that seems to be in Ireland. Corn and beans are the most common plants, but not limited to: pumpkins, cabbage, tomatoes, cassava and much more, allowing the population a variety of products for daily nutrition. Do you count the mango trees, papaya, bananas and cajù giving a production of fresh fruit that covers the entire year, but you can also enjoy peaches, apples, pomegranates, melacotogne for “marmelada”, figs, strawberries, pineapple , watermelons and grapes. All organic fruit that is the basis of our jams and our spirits. “Progress” has enabled also allowed us to develop agriculture is no longer based solely on the rains, the construction of wells allows you to have enough water and the “technology of drip” to use it sparingly on individual plants. 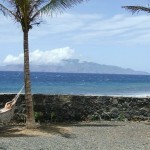 We then discover the island small plantations of fruits and vegetables active throughout the year. 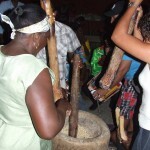 Maize (Fogo the white variety) is the base of Cape Verdean cuisine. The traditional dish, “cachupa” is a soup of corn and legumes that depending on the place is enriched with meat, fish, fruit and vegetables. 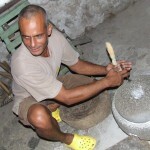 The different types of grinding corn are used for different dishes: xerem, farofa, pappa etc.. So the beans are grown in 6 different types and, unlike how it is used in Europe, with multi-year plants that are pruned periodically. 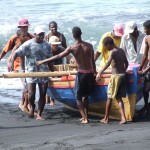 Fishing in Cape Verde is, for the most part, still artisanal, small wooden boats with 1.2 or 3 fishermen depart every morning motor (few) or rowing for the traditional rite of fishing. Networks are very few, here the vast majority still fishing with the “linha”, the line and this is “fighting” with small reef fish (Garopa, bica, bidion and rarely lobster) or large pelagic fish, tuna in greenhouse from amberjack to sailfish and marlin sometimes. 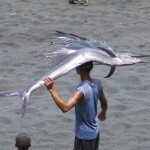 The show continues with the arrival of the boats many boys to earn the right to bring the fish in the country for sale: the big fish placed on the boy’s head and off to the market with the brim of fish as a reward. The freshness of the product is synonymous with goodness in the dishes that you can enjoy in restaurants. A small failure that can be attributed to Cape Verde is the lack of variety of fish that you will find on the menus of restaurants, which is why we offer our customers a wide range of fish to give way to try something different from the classics. Chapter crustaceans Merta the premise that in Cape Verde has unfortunately arrived interdiction of fishing for six months a year. Fishing pressure and in some ways “non-intelligent” is leading to a depletion of the sea if you can not control can be disastrous. 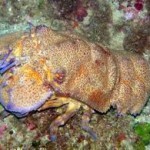 From May 1 to October 31 is prohibited fishing for all crustaceans (here especially lobsters and slipper lobsters), unfortunately the surveillance authorities and fishermen are few (thankfully few) continue their fishing almost undisturbed. On the other hand, if the tourists (without knowing) continue to order lobster at the restaurant …. Christmas warm. For those who do not like the snow is certainly a recurring dream. The imagery of Christmas with snow to cover everything, fireplace and walks well dressed against the cold, not here. We dress in shorts and T-shirt, you can swim in the sea, you can enjoy the warm tropical sun, but Fogo also offers the thrill of winter inside the volcano, where temperatures are close to 0 in the nights in December and January .